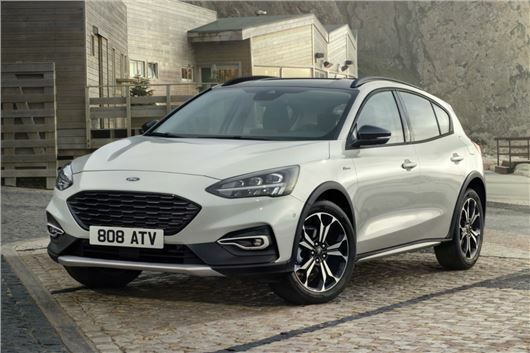 Ford has announced that its crossover Active version of the popular new Focus will start at £21,900 when it goes on sale in January 2019. Featuring a raised ride height along with new Slippery and Trail selectable drive modes, the front-wheel-drive Focus Active joins the Fiesta Active and Ka+ Active in the firm's line-up. Available as hatch and estate models, Ford says the new Focus Active will expand the appeal of its Focus range. “Ford SUV sales grew more than 19 per cent in October year over year, and SUVs now account for more than one in five Ford vehicles sold in Europe," said Ford of Europe's vice president, Marketing, Sales & Service, Roelant de Waard. As well as a bespoke suspension set-up with a ride height raised by 30mm at the front and 34mm at the rear, the Focus Active features 17-inch wheels with high-profile tyres as standard. 18-inch wheels are also available. In addition to the Normal, Sport and Eco selectable drive modes equipped as standard for all Focus models, the Focus Active introduces two new off-road modes. These include Slippery mode, which adjusts the stability and traction control systems to cater for low-grip conditions such as snow, mud and ice. Trail mode is also available, helping to maintain momentum on soft surfaces such as sand while also allowing more wheel spin to clear sand, snow or mud from the tyres. While car manufacturers have conducted a lot of research into how vehicles behave in snow, Ford says there was very little information about how wet leaves can affect a car's handling. To counter this, engineers took the Focus Active to a test track in Belgium where bags of leaves were distributed across the Tarmac. A friction-testing device then revealed that slippery leaves are just as dangerous as snow, helping engineers fine tune the Focus Active's Slippery mode. Ford Focus Active buyers will be able to choose from 1.0- and 1.5-litre EcoBoost petrol engines producing up to 182PS, along with 1.5- and 2.0-litre EcoBlue diesel engines with up to 150PS. Six-speed manual or eight-speed automatic transmissions are also available. Prices start at £21,900 with orders opening in January 2019 for Active and Active X models available in five-door hatch and estate variants. Like from their driveway to school, because let's face it, that's what this car is aimed at. "...deliver genuine rough-road capability for families who want to explore off the beaten track.” Like from their driveway to school, because let's face it, that's what this car is aimed at. I agree wholeheartedly. SUV's are popular because the marketing men in pink shirts tell us to buy one. The production lines are geared up for their production and we road users will continue to be harrassed by these large ugly beasts which are unsuitable for teh roads in teh UK. It's based on a Ford Focus. Hardly a "large, ugly beast"!